Five charts that show Germany is heading into recession | Business | theguardian.com. Germany is on the brink of recession. Recovery in Europe’s powerhouse went into reverse in the second quarter when the economy shrank by 0.2%. All the evidence suggests the weakness persisted in the third quarter amid tensions between Russia and the West over Ukraine and a flagging recovery in the eurozone economy. 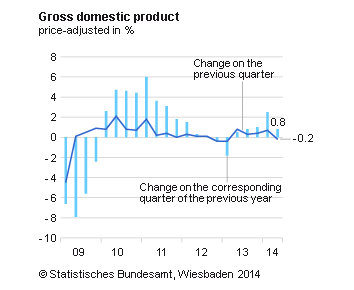 Here are five charts underpinning expectations of a fresh German recession. German exports fell by 5.8% in August. It was the biggest drop since the early stage of the financial crisis in January 2009. Imports also shrank, by 1.3%. It was worse than the 4% fall in exports and 1% rise in imports forecast by economists. Given Germany’s reputation as a manufacturing and exporting powerhouse, it does not bode well for Europe’s largest economy. 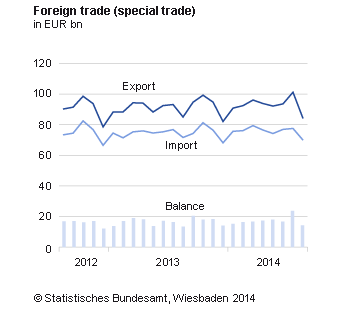 The drop in exports narrowed Germany’s trade surplus to €17.5bn (£13.8bn) from €22.2bn (on a seasonally-adjusted basis). Carsten Brzeski, economist at ING, described the figures as a “horror story”. 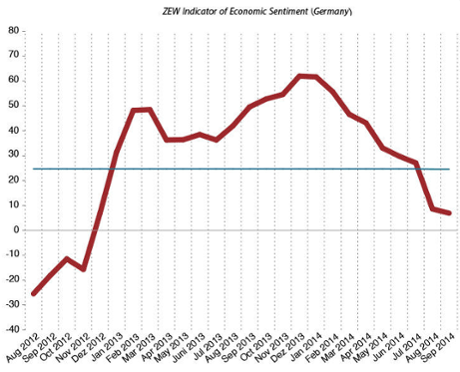 The ZEW indicator of German economic confidence is followed closely around the world. The measure of investor confidence is considered to be a useful signal of turning points in the economic cycle. 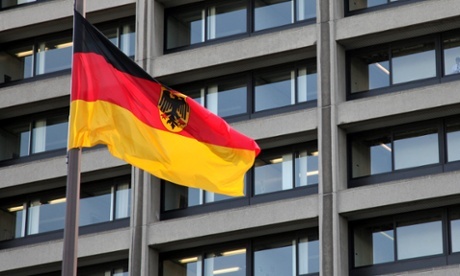 In September, the index fell for a ninth consecutive month to 6.9 points, as investor nerves persisted amid heightened uncertainty about the prospects for the German and eurozone economies in the coming months. 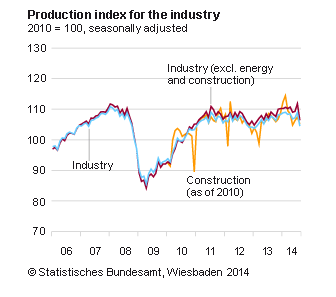 Industrial production slumped 4% in August according to Germany’s statistics office. It was an unwelcome surprise for investors and economists, following market predictions of a much smaller 1.5% contraction. Economists said that some of the fall could be explained by temporary factors such as the holiday season. But the scale of the drop could not be explained by one-off factors alone, suggesting genuine weakness in German industry. 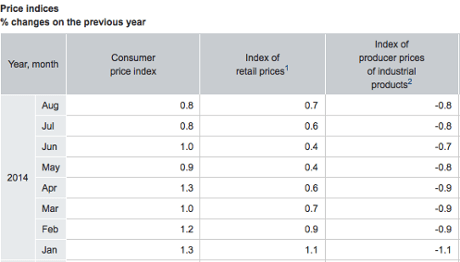 German inflation was unchanged at 0.8% on the main consumer prices measure in August. Low inflation is undoubtedly welcomed by Germany’s consumers, but lack of price pressure in the economy is reflective of a negative trend in the wider eurozone. In the single currency bloc as a whole, annual inflation is running at just 0.3% – sharply lower than the European Central Bank’s official target of close to but below 2%. Lack of inflationary pressure echoes the lack of growth in the troubled region. The fear is that it will lead to a dangerous spiral of outright deflation, where businesses and consumers delay spending because they expect prices to fall further. The International Monetary Fund has put the risk of eurozone deflation at 30%. Finally, this chart shows how close to recession Germany is. The economy contracted by 0.2% in the second quarter of 2014. A further fall in gross domestic product in the third quarter would tip Europe’s largest economy back into technical recession.